The Georgetown/Syracuse rivalry has plenty of history from these last few decades, dating back to the rounds of bouts between John Thompson, Jr. and Jim Boeheim during the 80s. Recent memory has certainly reinvigorated this: both teams have made Final Four appearances in the last decade, and both have been incredibly competitive in the Big East. As rivals in the 16-team conference, SU and Georgetown are one of the few pairs of teams that will often play twice during the regular season, once at each team’s home court. While Georgetown fans don’t exactly jump at the opportunity to head north every February to cheer on the road at the Carrier Dome, the same can’t be said for the opposite: between the many Syracuse alums who live down here and others who are willing to make the drive from various corners of the northeast, Verizon sometimes feels like some weird version of Syracuse South. Otto’s Army, a Syracuse fan blog, is suspicious that Georgetown has had enough of this Orange invasion – so they are doing something to try and prevent it for the February 26 match in Chinatown. The SU alumni club usually tries to buy as many tickets as they can, never having trouble unloading them. Last year, the club was able to buy 500. But not this year. According to our sources, Georgetown has given the SU alumni club the run around, and refused, thus far, to sell it any tickets. More on that further down. Yesterday, however, tickets were supposed to be made available to the public via Ticketmaster. However, if you go to Ticketmaster, this is what you would see. This is by no means a new tactic for major athletics programs with geographically close competitors. You’ll see it often by some of the biggest names (Notre Dame football, for example), but usually one catalyst on that is the fact that season tickets are generally impossible to obtain, so by protecting more of the seats for alums as opposed to the the public, usually they can keep even more boosters happy. Reading the account from an albeit biased source, that doesn’t seem the case here. While the Hoyas have the challenge of trying to fill a much larger arena than most other college teams, they usually don’t perform too much better than the usual Wizards game. With ‘cuse in town, the building gets packed, a great majority of that than usual is wearing the opposing team’s colors. In the spirit of gamesmanship and rivalries – if true – I love a maneuver like this. There’s nothing wrong with holding home court advantage and trying to make sure it stays that way. If you’ve been to a SU-GTown game, you’ll know that it does tend to get a little more neutral in there. Maybe the Hoyas just want to protect the house. Disc. : the author, while he will usually not admit it, has a postgrad degree from Syracuse; he has attended one of these Georgetown-Syracuse games at the past, sat in the 400 level and wore something with orange on it. As a Syracuse native who has adopted DC as my home and who loves almost everything about this city except Georgetown basketball, I have to say I’m unsurprised. It’s a program with a history of lackluster support and scummy, slimy people at the top (don’t get me started on John Thompson). I have been trying to get tickets and have experienced this too. And the way this was written makes Verizon Center seem enormous, it holds 20,000 – that’s 15,000 less than the Carrier Dome. A Saturday noon game against Georgetown? There would be at least 33,000. They get 20,000 on a Tuesday for an exhibition game. @PTRQ: excellent point on the latter half, although the Carrier Dome isn’t a fair comparison to anyone. Great local support, only team in town and a massive facility that’s on campus. The fact that VZN is smaller and can’t be filled – but still needs to be prevented from the Orange influx – says even more when you look at it this way. 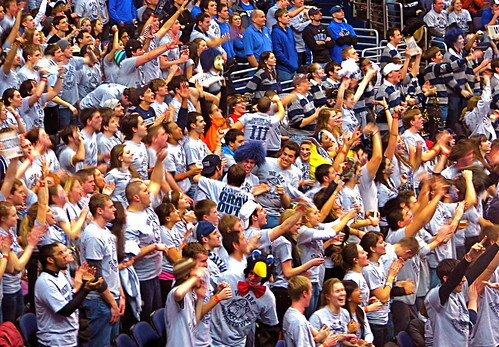 Georgetown did this against Duke last year, and managed to fill the place up with Hoya fans. Is it really that unusual? I’ve been surprised with the…well, surprise at the tactic. Don’t most teams sell tickets for high-demand games to alumni first? The Hoyas have a big problem with maintaining a true home court advantage, with so many opposing teams having strong DC fanbases. If they can tip the crowd for a major rivalry game in their favor, more power to them.